The Watts distillery (Andrew A. Watts & Co. Ltd., Londonderry - reputed to be the first distillery in the world to install a patent still) dates back to 1762 and had a proud tradition of producing good whiskies. Tyrconnell was their flagship brand which was a best seller in the United States before Prohibition and is named after a very successful racehorse owned by the Watt family. This historic whiskey brand has been kept alive by Cooley Distillery who has maintained Tyrconnell's reputation as shown by its Gold Medal win at the 2004 International Wine & Spirits Competition. The brand remained dormant until 1988 when Cooley Distillery acquired this old brand and went on its way to bringing this historical Irish whiskey brand back to life. 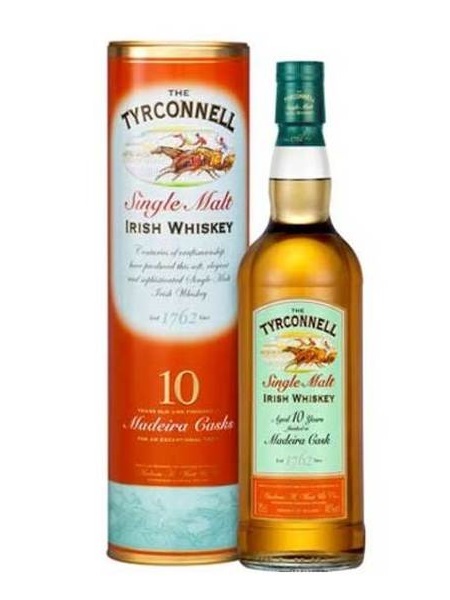 The Tyrconnell 10 Year Old, Madeira finished, whiskey is bottled at 46% ABV.